It might have sounded apocalyptic, but tectonic shifts of this kind are not unprecedented. They are the geographic counterpart to what the economist Joseph Schumpeter dubbed “creative destruction”—the great gales of change that level some companies and industries, and give rise to others. As powerful as they might seem in the moment, it is only when we look back through the lens of history that the full extent of economic and geographic changes becomes clear. Five years after the crash, with the national economy just beginning to return to something resembling normalcy, we can begin to trace the outlines of America’s emerging economic map—and take inventory of the places that are thriving, those that are declining, and those that are trying, in novel ways, to come back. The American economy is enormous, and enormously complicated. It comprises scores of industries harboring hundreds of occupations, spread across more than 350 metro economies, large and small. A variety of measures can be used to divine the health and prospects of these different places—population growth, job growth, housing prices, and the unemployment rate are among the more common. Each of these measures has its uses, but some of them can conceal as much as they reveal. Population growth, for instance, tells you nothing about the skills and education of the people arriving; job growth says nothing about whether the new jobs are good or bad. Throughout this article, I will draw on some of these measures. But I’ll lean most heavily on three measures less commonly seen in the popular press, but perhaps more telling: the composition of job growth (high-wage, mid-wage, or low-wage); productivity growth (which is the basis for improvements in the standard of living); and venture-capital funding (a proxy for the sort of entrepreneurial innovation that can power future growth). Taken together, the patterns revealed by these measures provide a fine-grained picture of America’s post-crisis geography. The economic landscape is being reshaped around two kinds of hubs—centers of knowledge and ideas, and clusters of energy production. 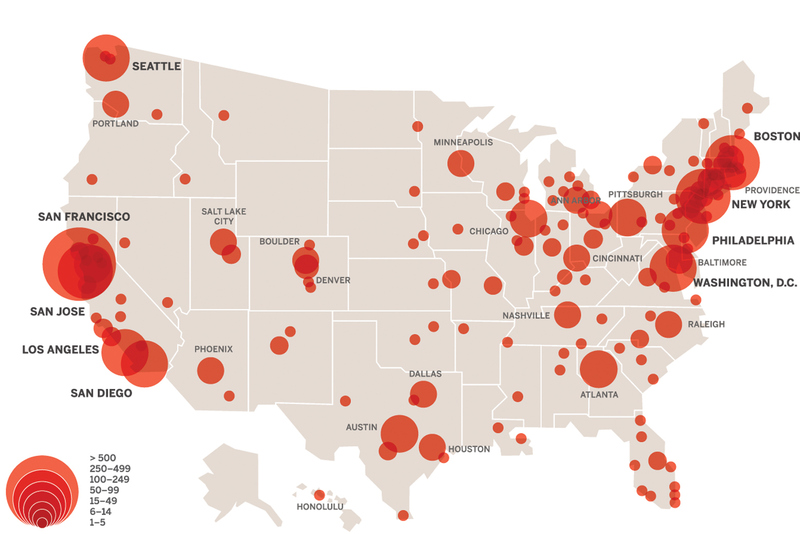 Overwhelmingly, these are the places driving the economic recovery. Outside them, the economy remains troubled and weak. New York City was widely expected to be devastated by the financial crisis. Wall Street’s collapse, the conventional wisdom went, would bring the whole city down with it. In 2009, I predicted that New York would in fact prove to be one of the country’s most resilient places. Even so, the speed and strength of its rebound has surprised me—its explosive growth as a start-up center especially so. New York’s financial sector did shrink somewhat—before the 2008 crash, finance and insurance accounted for 44 percent of Manhattan’s payroll; in 2009, 37 percent—but the city has retained its perch as a preeminent global finance center, and the reduction of the finance industry’s footprint has provided the spur and the space for other industries to grow. New York has incredibly high concentrations of management, media, design, and creative occupations. Since the crash, it has gained ground in its competition with Los Angeles as a center for media and entertainment (the imminent return of The Tonight Show, which decamped for Burbank, California, in 1972, is one result). Brooklyn—the setting for the HBO megahit Girls—has emerged as a major trendsetter for everything from film and television to indie rock and artisanal food. Then there is tech. Wall Street has always provided capital to high-tech businesses, but until recently, its investment dollars were typically exported to other regions. Yet over the past 10 years, greater New York’s share of the nation’s start-ups funded by venture capital has more than doubled, from 5.3 percent to 11.4 percent, far outpacing Silicon Valley’s rate of growth, with much of the growth occurring after the crash. In 2011, the city attracted more venture-capital investment than any other save San Francisco, nearly double Palo Alto’s, almost four times Boston’s, and more than six times Seattle’s. Tech clusters have sprouted in Manhattan, mostly in lower neighborhoods like the Flatiron District, and Chelsea and the Meatpacking District down to SoHo and Tribeca on the West Side. All of these neighborhoods are diverse places, filled with old buildings like the former Port Authority building that now serves as Google’s nearly $2 billion New York headquarters. Their repurposing as tech hubs only makes the city stronger and more diverse. New York’s rise as a tech center signals a major shift in the locus of venture-capital-fueled innovation. For a long time, high-tech start-ups have clustered in suburban office parks along freeways, places that are sometimes called “nerdistans.” But since the crisis, start-ups have taken an urban turn. San Francisco, which has fared extremely well since the crash, is a striking case in point. Over the past several years, Twitter has established its headquarters downtown, Pinterest has moved from Silicon Valley to San Francisco, and even Yahoo has created a new facility in the old San Francisco Chronicle building in the South of Market neighborhood. The legendary Silicon Valley investor Paul Graham saw this coming. “For all its power, Silicon Valley has a great weakness,” he wrote in 2006: “its soul-crushing suburban sprawl.” Today, San Francisco proper tops Silicon Valley as a center for venture-capital investment, by a wide margin. The same shift has happened in greater Boston, where venture-capital investment and start-up activity are now more concentrated in Cambridge and downtown Boston than in the suburbs along Route 128. What’s surprising is that tech stayed in the suburbs for so long. The urbanist Jane Jacobs long ago noted how cities, with their deep wells of intellectual and entrepreneurial capital, and their density and diversity, provide ideal ecosystems for entrepreneurial innovation. Nineteenth-century Pittsburgh and Henry Ford’s Detroit were the Silicon Valleys of their time. Suburban tech parks, of course, aren’t all about to be shuttered. Big, established companies like Google, Apple, and Facebook need the large amounts of space that their suburban campuses provide. Company shuttles will continue to run between San Francisco, where more and more workers prefer to live, and Cupertino or Mountain View. But new entrepreneurial activity is increasingly bubbling up from within the urban core. 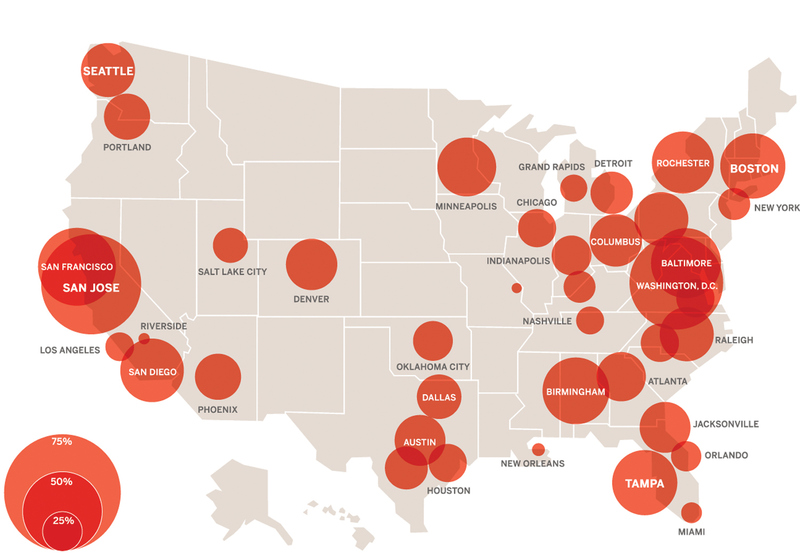 America’s “knowledge metros,” large and small, make up perhaps the biggest group of winners, overall, since the crash. Data provided by Economic Modeling Specialists International show that a handful of knowledge metros have an overwhelming lead in generating the high-wage jobs (those paying more than $21 an hour) that America needs. Nearly two-thirds of San Jose’s new jobs have been high-wage, as have nearly half of the new jobs in nearby San Francisco. San Jose also leads the nation in productivity growth, with a nearly 10 percent increase between 2009 and 2011, based on comprehensive data from the Bureau of Economic Analysis. Portland, Oregon, posted the second-highest level of productivity growth among large metros, nearly 7 percent, belying its Portlandia caricature as a place for slackers. Austin’s tech-fueled economy combined the fastest job growth of all large metros (10.5 percent between 2009 and 2013) with well-above-average growth in productivity and in high-wage jobs. College towns such as Boulder, Colorado; Ann Arbor, Michigan; Charlottesville, Virginia; Champaign-Urbana, Illinois; and Lawrence, Kansas, number among the nation’s leading centers for start-up activity on a per capita basis. And in general, college towns have combined low unemployment rates with stable economies. The strength of these smaller centers suggests that the future does not belong to large superstar cities alone. 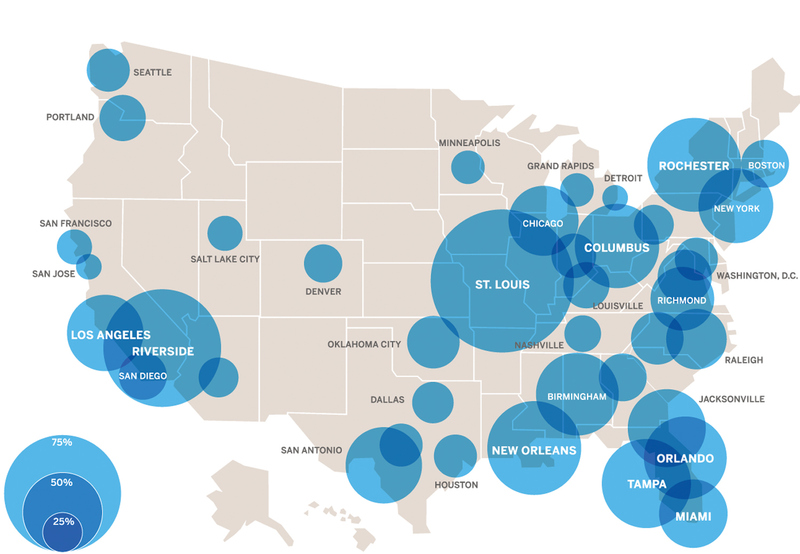 Knowledge, it turns out, is what allows metros to generate good high-wage jobs. Across America’s metro regions, I have found that high-wage jobs are closely related to several key markers of regional knowledge economies: the share of adults who are college grads; the share of the workforce in professional, technical, and creative jobs; the levels of innovation and venture-capital investment. That brings us to Washington, D.C. As the urbanist Aaron Renn wrote recently, Washington is well on its way to becoming America’s “second city,” on track to displace Chicago and Los Angeles “in terms of economic power and national importance.” Greater Washington has had among the nation’s lowest rates of unemployment, the most-stable housing prices, and high overall job growth since the crash. A whopping 59 percent of all new jobs created there since 2009 have been high-wage jobs, second only to San Jose. The Washington metro area includes six of the 10 most affluent counties in the nation. Washington’s economy has clearly prospered from federal spending; lobbying and government contracts are significant sources of its wealth. But its economy is not entirely or even predominantly parasitic. The decline in the federal workforce over the past several years (a result of austerity) has not substantially altered the region’s economic trajectory. 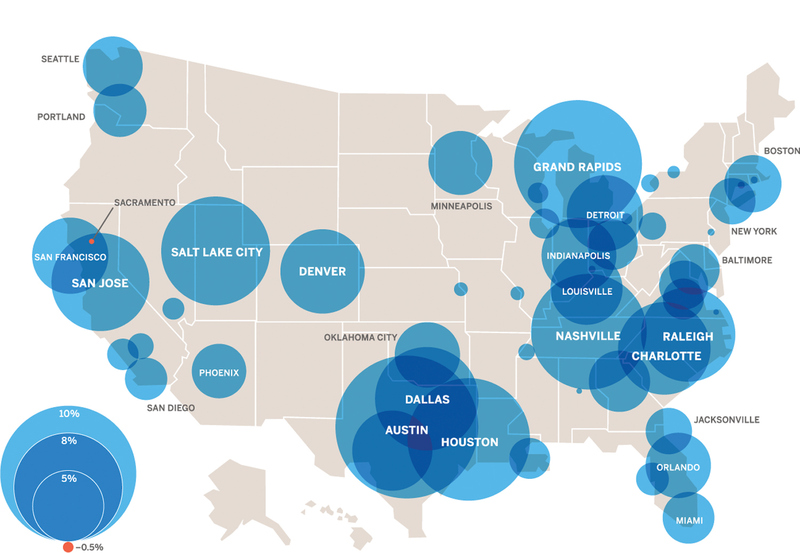 The ultimate source of the region’s wealth is Washington’s unparalleled human capital. The population is the best educated of any large metro’s in the United States; about half the region’s adults hold bachelor’s degrees, and nearly a quarter have graduate degrees. Greater Washington is much more economically diverse than its reputation suggests. It is a major center for media and real-estate finance, and is home to a small but growing cluster of high-tech activity, in the city as well as in outlying Maryland and Northern Virginia. The greater Washington metro area consistently ranks among the nation’s leading centers of venture-capital-backed start-ups, alongside noted tech hubs like Austin, San Diego, and Seattle. For well-educated professionals, especially those with families, D.C. offers tremendous quality of life and a raft of opportunities at a fraction of Manhattan prices. And indeed, it is the southern terminus of the vibrant economic corridor stretching all the way up to Boston, which produced more than $2.5 trillion in economic output in 2011, more than all of the United Kingdom or Brazil. One thing I didn’t foresee in 2009 was the stunning rise of America’s energy belt—a region stretching from Houston to Oklahoma City to New Orleans and their surrounding areas that in 2011, by my estimation, produced some $750 billion in total economic output, more than Switzerland or Sweden. The Sun Belt features two kinds of regional economies: declining real-estate economies and booming energy economies. Energy stands alongside knowledge as the second pillar of America’s recovery. Still, the energy economy involves more than just extraction. Houston has clocked the third-fastest rate of job growth of all large metros since the recession, 9 percent. Between 2009 and 2013, it gained more than 250,000 new jobs, 5.6 percent of all new jobs added nationwide. And its job growth has been balanced, with 24 percent coming from high-wage jobs (again, those paying more than $21 an hour), 48 percent from mid-wage jobs ($14 to $21 an hour), and 27 percent from low-wage jobs (less than $14 an hour). Houston’s high-wage-job growth stems from two main sources—the fossil-fuel industry and information technology. The city is home to more than a third of the country’s petroleum engineers and by far the highest concentration of geoscientists. From 2009 to 2012, Houston added 30,000 jobs in a mix of industries related to oil and gas extraction and scientific and technical consulting services. These pay an average salary of $124,000. Houston has also seen rapid growth in software-development jobs (16 percent) and information-technology jobs (12 percent), along with consistent growth in its medicine-and-health-care sector. Opinions vary on just how long the shale boom will last—especially in specific localities. And while energy metros have generated jobs, my analysis of all U.S. metros finds that in general, energy economies are not notable for high-wage-job growth. Nonetheless, the fracking boom illustrates how energy and technology are combining. Unlike some oil booms of the past, which turned on the discovery of new oil fields, we’ve known about these shale deposits for a long time. It was new technology that made exploiting them possible. Much has been made of the so-called resource curse—the syndrome whereby countries that are endowed with an abundance of natural resources get lazy, rest on their inherited riches, and fail to invest in the kinds of research, education, and innovation that are key to long-run development. That’s not what has happened in the United States. America’s leading energy hubs prosper not just because of the stuff they pump out of the ground, but because of their ability to combine resources with technology and knowledge. Cheap energy, especially from natural gas, has been a boon to the broader economy in the past several years, and still is today. Knowledge centers like Houston make it quite plausible that as the fracking boom eventually goes bust, other technologies will arise to provide new sources of inexpensive energy—and the growth that comes along with them. Sadly, the data bear me out. Just before the crisis, greater Las Vegas was one of the nation’s leaders in population growth; today it has the highest concentration of fast-food jobs in the nation. Palm Coast, Florida, the metro with the fastest population growth since 2001, has seen the nation’s worst rate of growth in economic output per person since that same year (negative 3.2 percent through 2011). Population growth alone has never proved a sufficient foundation for future prosperity—not when many of the new arrivals are retirees or modestly educated people looking to get in on a real-estate boom. But since the crash, even that imperfect engine has failed many Sun Belt cities. Buffeted by the effects of the housing-and-real-estate collapse, both Phoenix and Las Vegas saw their population growth stall in the wake of the crisis. And Sun Belt metros that were once rapidly growing, like Las Vegas, Reno, Miami, and Orlando, all saw their productivity decline between 2009 and 2011. The Harvard economist Edward Glaeser argued in April 2011 that “human capital follows the thermometer,” but the crisis appears to have broken this connection. My analysis, focused on the past four years, finds no association whatsoever between warmer temperatures and high-wage-job growth. The metros where low-wage jobs make up the largest share of job growth since 2009 are in the Rust Belt and the Sun Belt: St. Louis (where 90 percent of new jobs are low-wage); California’s so-called Inland Empire of Riverside–San Bernardino (where nearly three-quarters of new jobs are low-wage); New Orleans; Tampa; Orlando; Columbus, Ohio; and Rochester, New York (where more than half of new jobs are low-wage). Temp jobs account for an extraordinarily large share of recent job growth in Memphis, Birmingham, Cincinnati, Milwaukee, and Cleveland. It is striking, nonetheless, how some of the hardest-hit places have begun to sow the seeds of recovery in ways few people, including myself, would have predicted. Detroit has been a case study in industrial decline and white flight for decades. Long before the economic crisis, its population had cratered and its city services had collapsed. In many ways, things have gone from terrible to even worse in the wake of the crisis. As of July, the city is officially bankrupt, with the fates of thousands of municipal pensioners hanging in the balance. Yet amid all of that truly dreadful news are signs of a comeback. Despite the continuing exodus of its residents, Detroit has posted the third-highest rate of productivity growth of any large metro since the crash. And while the greater Detroit region is home to affluent suburbs and has world-class research and knowledge communities like Ann Arbor just outside its borders, reinvestment in the city’s once-burned-out core is spurring a partial recovery in Detroit itself. The past several years have seen a flow of new residents into the downtown area, including architects, designers, techies, and innovative musicians. Much of the immediate impetus for the boom has been provided by Quicken Loans, whose billionaire founder, Dan Gilbert, has been taking advantage of Detroit’s real-estate collapse to amass millions of square feet of real estate. A major new initiative is under way to animate the business districts with dozens of pop-up food markets, cafés, restaurants, and shops. Though these developments don’t begin to erase the city’s misery, the fact that some green shoots are pushing upward is astonishing. Cynics suggest that Hsieh’s Las Vegas and Gilbert’s Detroit amount to 21st-century versions of company towns, albeit more enlightened and less exploitative. Still, by bringing investment back to largely abandoned commercial corridors, they generate jobs in the urban core and provide much-needed tax revenues, giving hard-pressed cities the beginnings of a foundation that they can build on. America’s emergent growth model, which is taking shape around its knowledge and energy hubs, may be more powerful than its old one. That pre-crash model depended on the continual building of debt-financed houses with bigger and bigger footprints, sprawling ever outward. It was dirty, resource-inefficient, crisis-prone, and ultimately unsustainable. Clear away the rubble, and one can better see the country’s formidable strengths. The recovery has been more robust in the United States than many expected, much more so than in Europe. That’s partly a result of America’s willingness to print money and run substantial deficits. But what other nation has even one start-up ecosystem that can rival Silicon Valley’s, San Francisco’s, New York’s, or Boston’s—to say nothing of Seattle’s or Austin’s? What other nation boasts the number of world-class universities and college towns that America has? What other advanced nation can combine such knowledge resources with such abundant energy resources? The main threats to America’s growth model don’t come from other countries, but from domestic contradictions. The more talented people cluster, the greater the economic returns they produce. But as these clusters of highly educated people form and grow, they tend to push out the middle class, resulting in a ruthless sorting of people and places. As great as its potential may be, this new economic landscape is also notable for its widening fissures. The cultural, political, and economic gulfs that separate advantaged and disadvantaged people and places go well beyond the wage gap. Knowledge workers benefit from living in neighborhoods with better schools, better amenities, and lower crime rates, while less advantaged groups are sometimes stuck in place, with limited prospects for climbing even one rung up the economic ladder, and insufficient resources to move out of stagnant areas. Americans have seen a dramatic decline in economic mobility, overall. But a poor person from a knowledge center like San Jose or San Francisco has twice the chance of becoming wealthy as a poor person from some Rust Belt or Sun Belt centers like Cleveland or Atlanta. Reckoning with these deepening class and geographic divides, finding and implementing a set of policies that can build a sustainable prosperity for everyone, is the toughest and, at the same time, most urgent challenge we face.